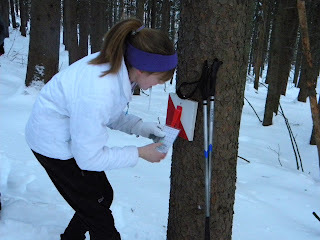 Bill Koch participants are invited to participate in our ski orienteering program at Notchview Reservation, in Windsor, Massachusetts. Modeled after the Norwegian skijeger’n (skijeger’n means the “ski hunter” in Norwegian), the program encourages kids to ski more and venture farther out on the reservation’s trails. Participants use the orienteering map to “hunt down” the 20 control markers located throughout Notchview. Affixed to trees along the trails, the numbered markers are 7” x 7” boards painted red and white. Each board has a different punch attached. Each skier gets a control card with 20 numbered boxes, one for each punch. The skier tries to find as many markers as possible, punching each box of the control card with the corresponding numbered punch. You can find the markers in any order, but make sure you punch the correct box on your card! Control cards must be handed in two weeks before the end of the Bill Koch season; the date will be posted in the lodge at Notchview.